Mother Nature offers an astonishing gift the week between Christmas and New Year’s. That’s when more than 18,000 gray whales cruise down the Oregon Coast to their winter migration destination, the lagoons of Baja, Mexico. Trained volunteers are present at 24 parks and viewpoints along the 365-mile coast, offering watching tips and excellent information about these remarkable marine mammals. The state parks department designates these locations as “Whale Watching Spoken Here” sites. The winter (southbound) migration sees the highest concentration of whales—about 30 an hour, and though many of them are out about three to five miles form shore, enough pass close enough to stir excitement and wonder. The Whale Watching Center in Depoe Bay is a great place to stop in for information and spotting advice. It’s open 10 – 4 September to May. Whale watchers are encouraged to report their sightings; the numbers and locations are collected and posted during and after each season. 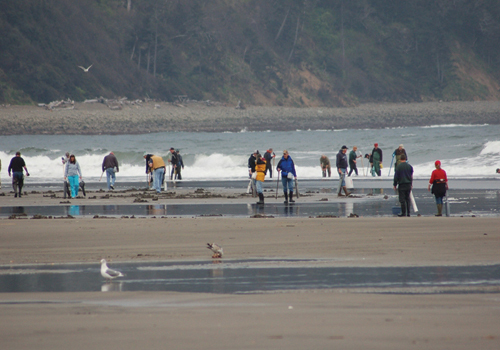 During the 2011 winter migrations, top watching spots included Cape Meares, Cape Ferreio, and Boiler Bay. 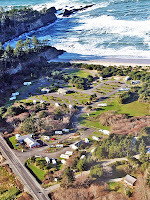 Many Oregon coast state park campgrounds are open year-round. Among them: Cape Lookout, Cape Kiwanda, and Beverly Beach State Park. National Park funds dangling off "Fiscal Cliff"
In the “all-things-being-connected” category... the fiscal cliff crises means our beloved national parks are facing big cuts in funding and fewer American may have less money to travel if taxes are increased—which, in turn means towns and communities will also suffer from lack of revenue generated from park visitors. The National Park Service is looking at an automatic 8.2 percent cut in government support—$218 million across the country. To put that figure in perspective, it’s the amount of money the agency spends at the 150 smallest national parks, among them the Northwest’s Klondike Gold Rush National Historical Park, San Juan Island National Historical Park, Fort Vancouver, and Lake Roosevelt National Recreation Area. Mount Rainier has a current annual operating budget of $11.7 million, down $500,000 over the past couple of years. Small changes, like closing the road from Longmire to Paradise on Tuesdays and Wednesdays, save money by cutting back on snow removal—because there’s not enough money for the crews. FORT EBEY STATE PARK, Wash. — Fort Ebey State Park on Whidbey Island is closed as rangers search for two aggressive dogs that bit a man and caused a woman to seek safety in a park bathroom, reports KIRO Seattle. Park Manager Jon Crimmins is quoted in the news article saying he came face to face with the two dogs late Tuesday afternoon and the dogs that looked like pitbulls were incredibly aggressive. KIRO reported that Crimmins and his partner returned Wednesday morning with an animal control officer to search for the dogs, but haven't found any sign of them. The park website had this closure listed on its website Thursday afternoon: Fort Ebey State Park is closed until further notice. Aggressive, unattended dogs were discovered at the park the evening of Dec. 11. At this time, rangers and county animal control officers are working to confirm the location of the dogs and place them under control. Until this occurs, the park will remain closed. To read the complete report from KIRO Seattle, click here. Thanks to RVdailyReport.com for alerting us to this story. 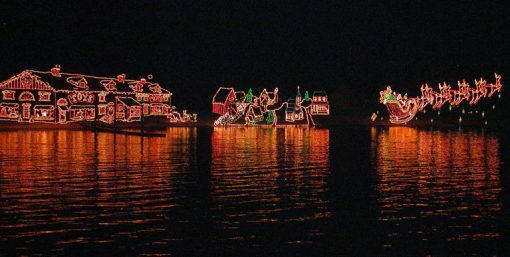 Sitting along a lake that National Geographic has named one of the most beautiful in the world and surrounded by rugged Idaho wilderness, it’s the little city of Coeur d’Alene that throws the switch on the largest on-the-water light show in America! More than 1.5 million lights and 250 displays sparkle along the waterfront. Take a Lake Cruise for a magical experience and the best views (and photos). Santa’s working hard at the North Pole and waiting for the kids, grandkids, and your inner child, to travel across the water by boat to visit. This year, the Workshop is crowned by the World’s Tallest Living Animated Christmas Tree, aglow with 30,000 lights. Don’t tell anyone, but it’s twice as tall as New York’s famous Rockefeller Center’s Christmas tree! Suntree RV Park in Post Falls (11 miles from Coeur d’Alene) has 81 full hook-up sites and is open year-round. River Walk RV Park right in Coeur d’Alene has 35 RV spaces with full-hookups and is open year-round. 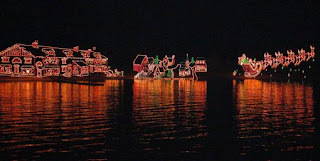 The Holiday Light Show displays are illuminated until January 1, 2013. For more information, click here. Good news for Washington park visitors in the coming year! Now you can choose the start date of the annual Discover Pass, which is required on all motor vehicles, including RVs, entering recreation lands managed by the state. 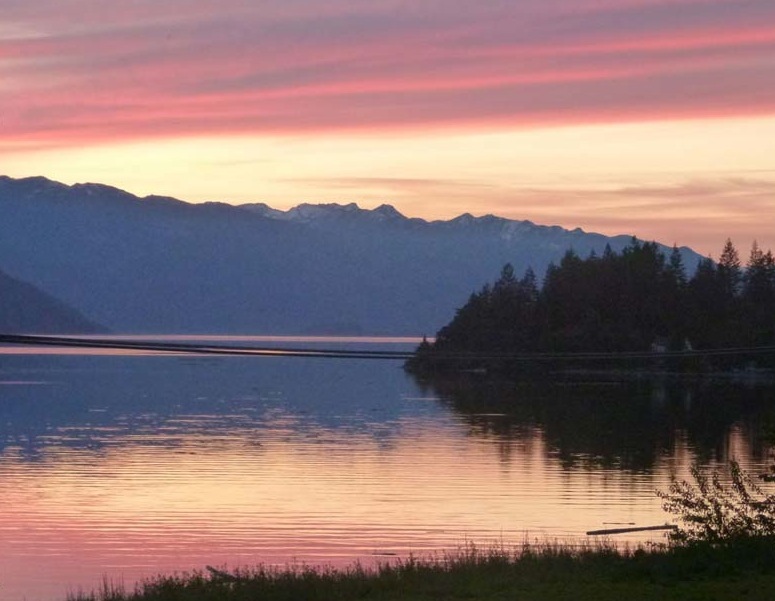 In an effort to support the ongoing operation of recreation lands, Washington State has been considering a variety of creative options. The "choose your date" option proposal was passed in 2012 and takes effect immediately. Those who enjoy giving recreation-related gifts to friends and family will now have the opportunity to do, starting with this December holiday season—and for any occasion in the new year. The pass is valid for one year from the date specified at purchase. 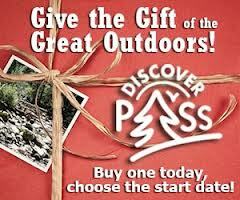 To purchase your Discover Pass online and select the “choose your date” option, click here. Or, purchase the Pass from retail vendors who sell the licenses. A complete list can be found on the state Department of Fish and Wildlife website. Click here. For RVers and weekend wanderers, an Oregon State Parks Parking Pass is already great deal at $30—considering it has limitless use for an entire year. But for the month of December, the pass will cost only $25, making it a perfect stocking stuffer for the park explorer in your life. You can also double your value by purchasing a two-year pass for just $50 (regularly $60). In addition, the Oregon Coast Passport will cost only $30 in December; it’s $35 otherwise. The multi-agency pass is valid at Oregon State Parks, U.S. Forest Service, Bureau of Land Management and National Park Service sites along the Oregon Coast. Gift certificates in any amount are also available, making it a fun gift for kids of all ages. Discounted passes and passports are available December 1–31, 2012 by calling the Oregon State Parks Information Center at 1-800-551-6949, Monday–Friday, 8 a.m. to 5 p.m. Callers may use debit or credit cards that have VISA or MasterCard logos to purchase permits, passports and gift certificates. You can also purchase any of the above at vendors throughout the state of Oregon. Click here for a complete list. Starting January 1 campers over the age of 60 and service-disabled military veterans will enjoy discounts at parks run by Idaho Power. Seniors will receive $2 off regular overnight camping fees; disabled military, 50 percent off the nightly rate. The three-year pilot program was instituted when Idaho Power announced it would have to start charging for overnight camping, about a year ago. When the Disabled American Veterans organization of Payette, Idaho heard about the fees for their parks, they approached the company to see if they could at least qualify for a discount. Six months later, Idaho Power came back to the group with a new fee-discount pilot program. They also added the senior price reduction to encourage family camping. While day-use of the parks has always been free, overnight camping at the Hells Canyon parks costs RVers $16 a night (April through October); $8 (November through March)—before the applicable discount. The four campgrounds along the Snake River at the C.J. Strikes Reservoir cost $10/night in high season, and $5 in low, also before any discounts. 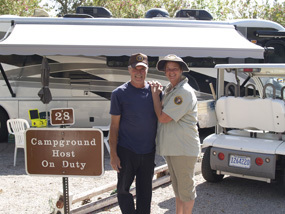 Campers 60-plus will need an ID (driver’s license or other official identification) to qualify for the discount; disabled veterans will need either an Idaho or Oregon Department of Parks and Recreation document, or a copy of their V.A. disability document. When using a fee envelope at the park campground, check the appropriate box or simply write in the reason for the discount. All of the park campgrounds will maintain their first-come, first-served basis and there is a 14-day stay limit for everyone. For more information on camping and recreation areas managed by Idaho Power, click here. 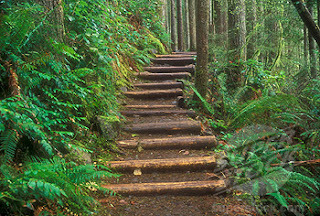 Put in 24 hours of pleasant enough work in good company—planting trees, cleaning beaches, repairing trails—on Washington’s beautiful recreation lands and you’ll earn a free Discover Pass for a year’s worth of entrance to your favorite forest, lakeside, or coastal park. The parks post the available work projects on their website, or you can check with your local ranger for upcoming needs. He/she will also be the one you “report to,” and the official who signs off on your hours voucher. Once you’ve fulfilled your 24 hours you mail it in to redeem your Discover Pass. Over the past 13 months more than 500 free passes were sent out to volunteers, the equivalent of one million paid-for passes. The revenue is split in percentages: 84 percent for the state parks, 8 percent for the Department of Natural Resources, and 8 percent for Fish and Wildlife. For those who love these special places in the Northwest, think of the work as the grown-up version of a Scout patch, proudly earned. Digging for dinner: Keep clam and carry on! For hardy RVers, November can be a real “bonus” camping month. Case in point: if you’re anywhere near the Oregon coast in the next few days, head over to Garibaldi Bay and reap the tasty rewards of the extreme low tides coming up on Wednesday and Thursday, November 14 and 15. We’re talking five varieties of clams beneath the surface of the miles of exposed sands: razor, butter, gaper, bay, and cockles—the chowder kings. If it’s delicious Dungeness crabs you’re into, walk a few steps over to the Garibaldi Pier and make a haul—there’s an abundance of them right now, too. 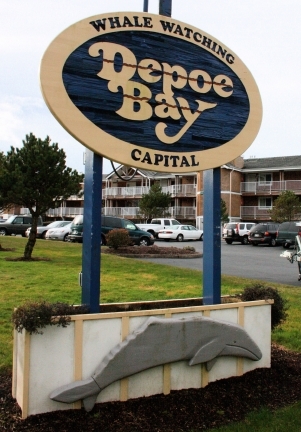 You can park your RV right on the Bay and just a few steps from the popular Garibaldi Pier at The Harborview Inn and RV Park, a friendly, family-run establishment open year round. There are 30 RV spaces (and pull-throughs for any size) with 20-30-50 amp electrical, water and sewer, and cable TV and Wi-Fi included in the $30 per night cost. Pets are always welcome. Harborview also has all the trappings and equipment you need for the Northwest clamming experience: licenses (which cost $7 for Oregon residents and good for the rest of 2012, and $11.50 for non-residents, good for three days. ), crabbing and clamming gear, and there’s even a crab cooker available. So embrace your inner November RVer! Throw those old rubber boots in your storage bin, grab an extra fleece and all-weather gear, and enjoy the timeless pleasure of “catching” your dinner on the most beautiful seacoast in America. Click here for more information on Harborview Inn RV camping. According to an article on November 4th in The Columbian, Washington’s beloved state parks are in a financial bind. Revenue projections are falling short and the new Discover Pass user fee program isn’t proving to be a dependable source of income. As a result, the Washington State Parks Department is seeking federal funding in the amount of $27 million for the next two years, a figure that Parks officials say would keep the agency up and running. Legislators have previously said state parks may get no general fund money in 2013-15. But, according to a department report released earlier this year, that can’t even be an option if state parks are to remain a viable program. Washington’s State Parks Department has had to deal with huge cutbacks—from $98 million in 2007-09 down to $21 million at present. And, since 2008, one third of the Parks’ permanent full- time jobs have been cut. Other employees have been downsized to seasonal positions, reshuffled to other places, or let go. One thing the agency hasn't done is close any of Washington's 116 state parks. Keeping them open remains a top priority, particularly now that people are being asked to pay more to directly support them. 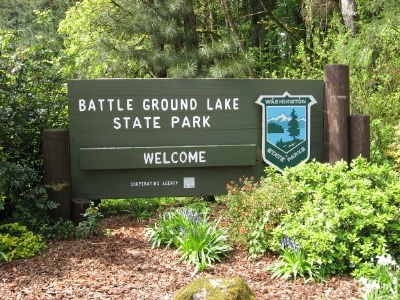 As of right now, though, there is no crystal ball that shows what, if any, help state parks will get form Washington’s general fund, once lawmakers come back to Olympia. State revenue projections aren’t looking rosy, and there are many other state agencies petitioning for help before the 2013 legislative session reconvenes. If you haven't visited Washington's Olympic Peninsula, then watch this short video to see what you were missing. And what were you missing? A lot! What a gorgeous place, and plenty of campgrounds, many year round! The Washington State Parks and Recreation Commission is beginning a process that will lead to a long-term plan for Camano Island State Park. The public is invited to a meeting on Thursday, Nov. 15, from 6:30 to 8:30 p.m. at the Cama Beach Center, located at Cama Beach State Park, 1880 S.W. Camano Drive, Camano Island. The meeting is the first step toward a comprehensive plan for the park. The Classification and Management Plan (CAMP) will address overall visitor experiences, natural resources, use of the park’s buildings, recreation areas and trails and other topics of interest to the community. The meetings will address the overall CAMP process and the public’s hopes and concerns for the park. Information about the planning project is available online at www.parks.wa.gov/plans. Public comment also may be provided by e-mail to Camano.Island.Planning@parks.wa.gov or calling (360) 902-8616. 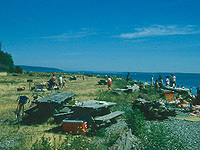 Camano Island State Park became functional in 1949 after the South Camano Grange successfully got the Department of Natural Resources to make property available. Initial improvements for the 134-acre park were provided by 900 volunteers in one day, when they constructed a small picnic area still in existence. Since then, park staff have The park receives approximately 200,000 visitors a year. Tsunami Stout, The Mother of All Storms, MacPelicans Wee Heavy Ale ... Who knew tiny Pacific City (aka “middle of nowhere” according to some), Oregon would boast the only coastal brewery in the Northwest? And award-winning beers to boot? 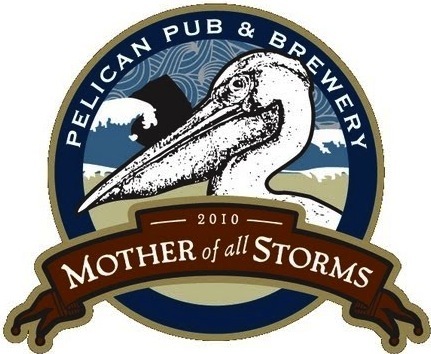 Located about halfway between Lincoln City and Tillamook, the Pelican Pub & Brewery claims a gorgeous wedge of real estate right on the beach at Cape Kiwanda, a scenic jewel even for this spectacular coastline. The haystack rock rising from the surf is one of two along Oregon’s rocky coast—this one’s the biggest. Think pints and sunsets when you’re planning that late fall or winter camping expedition. And if Mother Nature hasn’t provided enough jaw-dropping beauty in this one teeny tiny corner of North America, just wait till the gray whales cruise across your line of vision in the late spring or late fall migrations (coming up in mid-November). If you happen to be a fisher-person, the Little Nestucca River, which runs into the Big Nestucca River, is famed for its huge Chinook salmon that run in autumn, and an excellent winter run of Steelhead and Cutthroat Trout. Put on those fashionable weatherproof layers we Northwesterners are so famous for and fill up the propane tank ... friendly Pacific City and a frosty Stormwatcher’s Winterfest at the Pelican are waiting to warm you up! 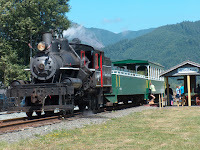 Trade in your RV wheels for a steam locomotive ride along a gorgeous strip of Oregon coastline. Although the tourist season is coming to a close, the Oregon Coast Scenic Railway (OCSR) offers a special autumn weekend, Saturday and Sunday, October 20 & 21. One hour rides between the historic fishing village of Garibaldi and Rockaway Beach come with scenic views of Tillamook Bay and the Pacific. You can even ride behind the vintage diesel locomotive, which is all decked out for fall. This family-friendly event encourages kids to dress in their Halloween costumes—there are prizes for the best costumes during each of the three daily rides. 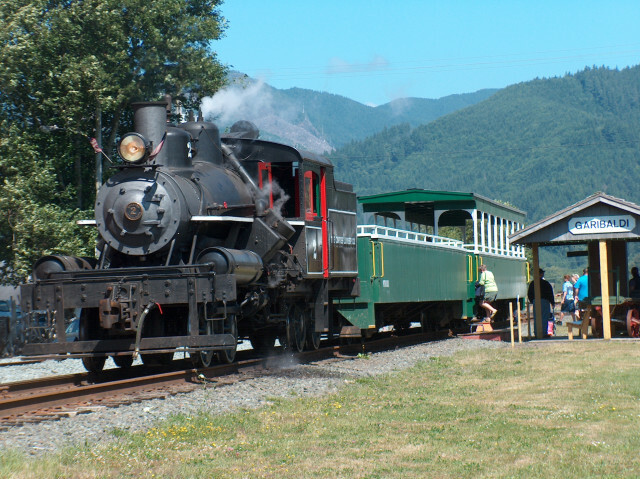 The Railway has been operating since 2003, when railway enthusiast Scott Wickert brought his steam locomotive, CLC #2, to Tillamook and founded a steam railroad and logging/antique railroad equipment museum. With community support strongly behind him, the OCSR will celebrate a decade of train rides that have entertained and educated visitors from around the world about the importance of the steam trains that once worked the rails of the western coastline. Departures from Garibaldi at 11 a.m., 1 p.m. & 3 p.m. 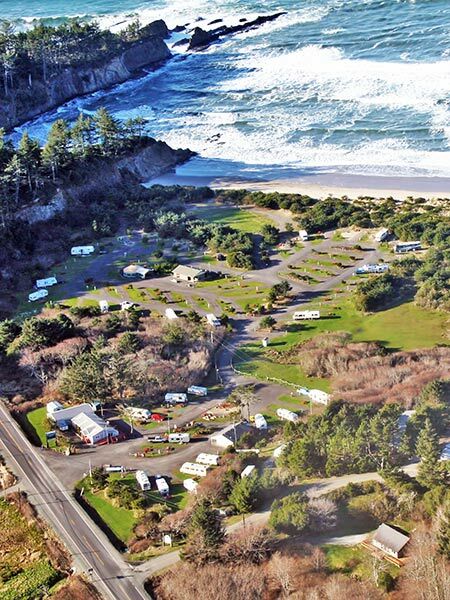 If you’re in the neighborhood and looking for a good place to hookup, the 45-acre Old Mill RV Park is located right on Tillamook Bay. The Nez Perce National Historical Park is a collection of 38 sites that spread into four states: Washington, Oregon, Montana, and Idaho. Beginning mid-month and continuing through the end of October, autumn leaf colors and golden landscapes are expected to dazzle. The spectacle drapes the riverbanks and canyons, prairies and mountains, plateaus and plains of the park; two beautiful drives make for a picture-perfect fall foliage RV adventure: the Lewis and Clark Trail and the Nez Perce Trail. The open landscapes of White Bird Battlefield and Spalding (both in Idaho) turn tawny and scarlet, while stands of aspen and cottonwoods, along with the sagebrush steppe of Buffalo Eddy in Washington glitter in golden hues. If you visit this area, don’t miss the amazing petroglyphs. Unique for its cultural significance the Park offers a multi-layered look at a culture that never arrived from somewhere else ... the Nez Perce have always inhabited this vast swatch of the central Northwest. Be sure to visit the two excellent museums within the Visitor Centers to learn about the traditions and lifestyle of the Nez Perce. The Park Headquarters and Visitor Centers at both Spalding, ID and Wisdom, MT are open year-round. Click here to plan your visit and check hours. While there is no camping within the national park, dozens of campgrounds are located close by in all four states. Click here for camping information. There are no entrance fees to the Historical Park. 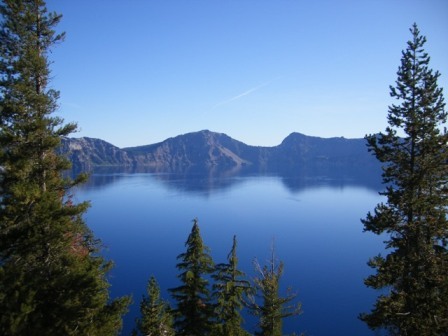 From now until April 30, 2013, the Oregon Parks and Recreation Department invites your inner adventurer to keep on camping with special Discovery Season rates at all State Parks that remain open year-round. 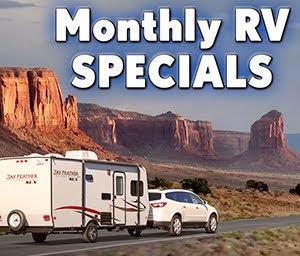 Depending on which park you choose to visit, RVers can enjoy full hookups sites for prices as low as $16 a night (the maximum Discovery Season campsite price is $23). There are obvious advantages to camping in these early fall days ... The weather for one; it can be very mild throughout the state for much of October and into November. In the mountain foothills, autumn colors accent the evergreen. And, where reservations are almost always necessary in the peak summer season, now you can drive around and pick a spot that calls your name. If you’re a weekend camping warrior, you can pack up at a whim and head for your favorite park, pretty confident that there will be open campsites. In winter, camping near the ocean offers the dramatic spectacle of big surf, while mossy forests provide verdant shelter and fragrant campsites. Click here for a complete list of State Parks and Discovery Season rates. Move over yurts--camp in a container! Seems like park operators are always trying something new: First there were cabins, then yurts, the occasional tipi, and now--shipping containers? Sure enough, a county park in Washington State now offers campers the opportunity to overnight in a used cargo container. 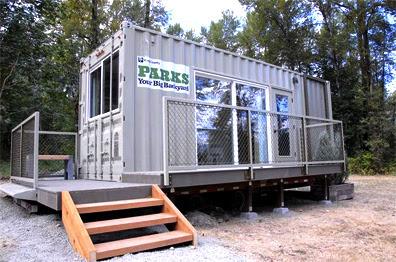 Tolt-MacDonald Park near Carnation, Washington recently installed a 24-foot shipping container. Of course, being locked into a dark, steel box doesn't have too much appeal, so the new park rental is equipped with windows, a door, a bunk bed, and a kitchen constructed from recycled materials. Much of the interior stuff can be put outside on a deck so that more inside floor space is available--say you want to have a few friends over for a square dance. It may sound a bit odd, but King County Parks says it's all in the name of sustainability and a "green" future for parks. For $50 you can stay in this rusty--er--rustic sustainable cabin. There are 175 national forests and grasslands across America and, as recreation budgets and staff are being reduced, volunteer host positions are on offer from sea to shining sea. These are wonderful opportunities for RVers who want to establish a base for a month or more and really explore these treasured lands. The job is straightforward ... the host is there to provide good information in a friendly manner to campers about the park and area, to monitor the campground for the Forest Service, and to perform light general maintenance duties. As a volunteer host, you’ll receive a free campsite for the duration of your stay. 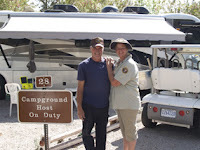 And, since the need for volunteer campground hosts is year-round, you don’t have to limit yourself to just one area. You can host in, say, Washington’s Olympic National Forest, then head to the Southwest when the snow flies! The excellent website www.forestcamping.com offers a comprehensive guide to the developed campgrounds in national forests and grasslands and specifies the host needs for each one. There are multiple positions listed in the Northwestern States (Washington, Oregon, Idaho, and Montana) and those interested in applying for a host position, can do so directly with the Forest Service Employee contact. The email address is included with each listing. Click here for a list of state-by-state host positions. Just off Highway 101, halfway between Port Orchard and Gold Beach, dinosaurs lurk in the rainforest—well, okay dinosaur replicas. They’re actually scientifically accurate, though; their measurements are based on fossil skeletons, which means they’re life-sized! This classic roadside attraction is a great place to bring the kids (of all ages) if you’re out camping this fall... The dripping mosses, lush foliage, and that rich earthy smell of the season give this unique park a Jurassic feel. Oregon sculptor, Ernest Nelson created each of these creatures, combing his love of art and his passion for the prehistoric world. He began the project in 1953 and spent the next 40 years constructing the 23 specimens of the menagerie, which includes a nest of hatching triceratops, a colorful dimetrodon, flying pteranodon, and a very toothy elasmosaurus. The park is open year-round (sometimes the owners close up shop in late winter for a couple of weeks), daily from 10 a.m. until 6 p.m. Sitting pretty at 6,547 feet in the Sawtooth National Recreation Area, glacier-carved Redfish Lake makes for a perfect September getaway—think cobalt skies during the day, and a starry canopy in the evenings. 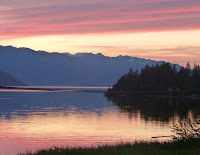 The lake was named for the thousands of sockeye salmon that once came to spawn here. Dozens of hikes, including easy loops such as the Fishhook Creek Trail, offer stunning alpine views and possible glimpses of some of the local wildlife, such as elk, moose, pine martin, and osprey. You can also rent a bike for a trail ride, or experience the natural splendor on horseback. And, for anglers, nearby Salmon River is known for the “big ones” that don’t get away! Situated right on the lake is the 1920s Redfish Lodge (open until early October), which offers a rustic dining room and locally famous breakfasts, lunches, and dinners. If you want a break from cooking in the RV and a chance to enjoy Idaho wild game, salmon, and trout, this is a wonderful “on-location” treat. 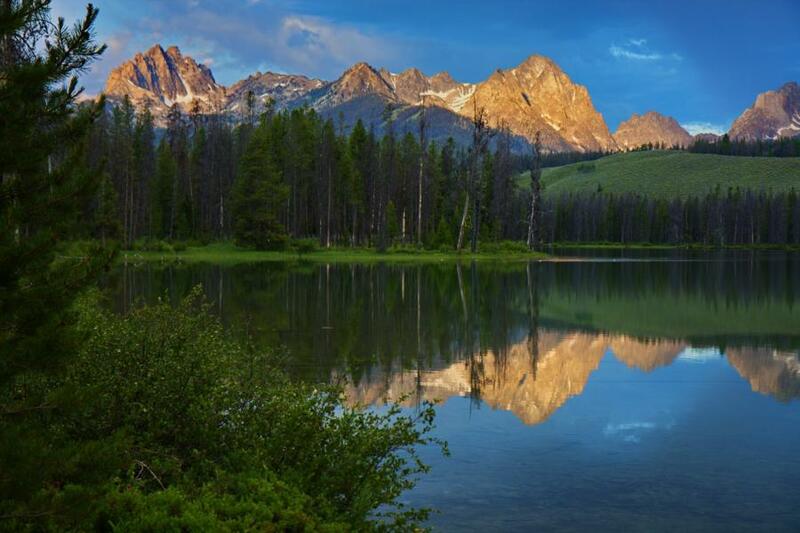 Redfish Lake is just five miles south of the friendly town of Stanley. About 15 miles north is the ghost town of Custer, complete with Boot Hill Cemetery. 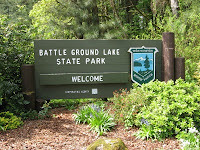 There are several campgrounds close to the lake, run by the Forest Service, which can accommodate RVs. For information and reservations, call: 877-444-6777. 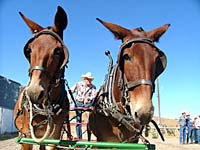 Ride on over to Hells Canyon for Mule Days fun! Remember those amazing mule-team “trains” that once rambled across the Great Plains and through the western mountain states? Well, no, of course you don’t, but here’s your chance to help celebrate the pioneers and cowboys, and their hard-working mules, that created our iconic American West. The 31st annual Hells Canyon Mule Days takes place next weekend, Sept 7, 8, 9, in northeastern Oregon, in Enterprise, and it’s totally worth hitching up your RV-wagon and gittin’ yerself over yonder. Weekend highlights include mule-driving events, comic log pulls, barrel racing, pole-bending, and mule team branding. Don’t miss the non-motorized Grand Parade on Saturday, starting at 11—it’s a hilarious delight, complete with all manner of mule- and miniature-horse-drawn contraptions. 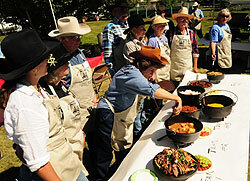 Right afterwards, at 1 p.m., The Grand Entry and Mule Show fun and entertainment begins. Be sure to attend an authentic cowboy poetry reading, and check out the handmade crafts in the exhibit halls, including the gorgeous traditional quilts. We betcha won’t be able to resist some of those mulish “souven-ears!” In-between all the fun, treat yer belly to smoky barbecue and beans and Dutch oven casserole fare—good grub just like on the range! When you think of Northwest mountains, the Selkirk Range seldom rolls off the tongue first. But for those in search of a unique Northwest road trip, the Selkirk Loop—which winds through northern Idaho, Washington and British Columbia—deserves a special tack on the map. The 280-mile road follows rivers and lakeshores once used for regional transportation. It traverses narrow canyons, fertile valleys, and broad meadows back-dropped by snow-capped mountains. This is a take-your-time adventure worthy of a few leisurely days, with recreational opportunities for every age and interest. Swim, canoe or kayak, go rafting, or drop a line along the miles of pristine shorelines. Go horseback riding, hike through virgin forest and past dazzling waterfalls, and go geo-caching in the national forests or provincial parks along the way. With autumn coming up, red and yellow foliage creates a patchwork of color among the stands of pine, and countless numbers of Canada geese stop for breaks here during their southbound journey. Farm stands are overflowing this time of year, too; stock up with fresh fruits and veggies and chat with the local growers, and the shopkeepers in the charming towns of Bonners Ferry, Creston, or Nelson, to name just a few. And as a special side trip (we’ve done this and highly recommend it), don’t miss the chance to ride the Kootenay Lake Ferry—the longest free ferry ride in the world. It’s nothing short of spectacular! For an uncrowded, close encounter with the inland Northwest, treat yourself to the Selkirk Loop—a unique and unforgettable RV adventure. Here’s the link to The Loop driving map. 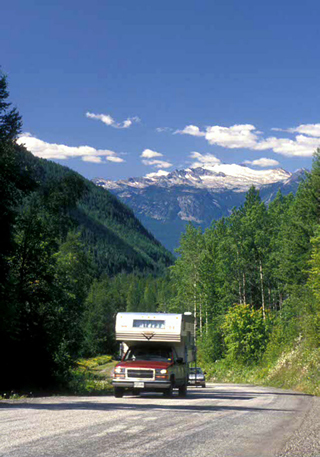 Click for a list of Campgrounds and RV Parks along the Selkirk Loop.